Second post in one day, awesome! I have just completed a breakdown sheet that breaks apart the shading network for the Big Guy head n shoulders rig. 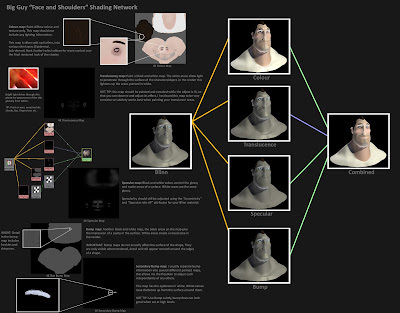 I will be using it to help explain my texturing process and teach my students how to go about creating a shading network for a character in Maya next week. Big Guy shading network breakdown.